Basically, that means that we have created a web-based application that allows neighborhoods to communicate more easily than ever before. Unlike traditional websites that HOAs or neighborhoods put up for their residents, our application allows every resident to contribute. You also don’t need a web developer to create or maintain the site and its content. 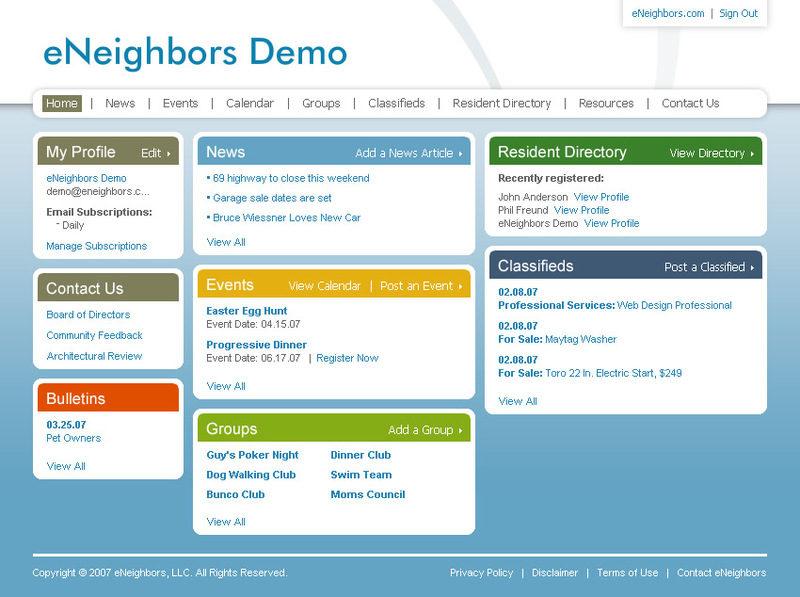 The eNeighbors application is so much more than a website. It also provides great social networking features that you might be familiar with on sites like Evite, Craigslist, and Meetup. As promised, here’s a look at the application. This is the “Home” page a resident sees once they sign in to their account. I want to to wofk with jut about all 50, 000+ pics in our computer system seeing that pc track record. ended up after thhat “sorted” by simply rating). As i transform this slideshow peiod of time, Glass windows doesn’t constrantly use the actual modify. slides for a prior time period. Anyy ideas? around the 810 consequently didnt feel it will function. the wallpapers, a similar approach you employ. sed diam nonumy nibh euismod tincidunt lace laoreet dolore agna aliquam erat volutpat. also spent a lot of time wallpapering ths together with Vintge style paperwork. yourself designing your own lovely property! Hello Wende, Picmonkesy is very user friendly, I believe you’ll love it! I like this particular! Downloading it now!